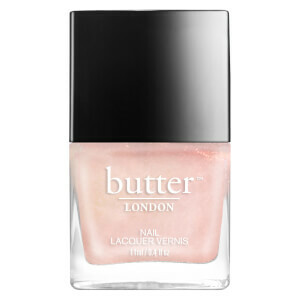 Preserve and protect your manicure with the butter LONDON Hardwear™ Shine UV Topcoat; a fast-drying formula that leaves nails with a chip-resistant, high-shine finish. 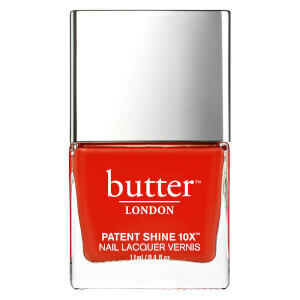 Prevents fading and smudging of your favourite nail polish for a salon-style finish from home. Apply one coat over your favourite butter LONDON nail lacquer. Ethyl Acetate, Butyl Acetate, Cellulose Acetate Butyrate, Isopropyl Alcohol, Acetyl Tributyl Citrate, Adipic Acid/Neopentyl Glycol/Trimellitic Anhydride Copolymer, Acrylates Copolymer, Benzophenone-3, Trimethylpentanediyl Dibenzoate, CI 60725 (Violet 2). I am going through chemotherapy and my nails need even more help than usual. 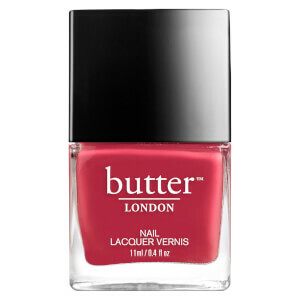 Chemo means I need to find natural nail products and I came across Butter on a internet search. And I am so glad I did. After 3 weeks of use of base coat and top coat my nails are stronger and growing nicely. It is even reducing the down the nail splits. A great product which I would recommend to everyone who likes to give this nails a treat and look good.